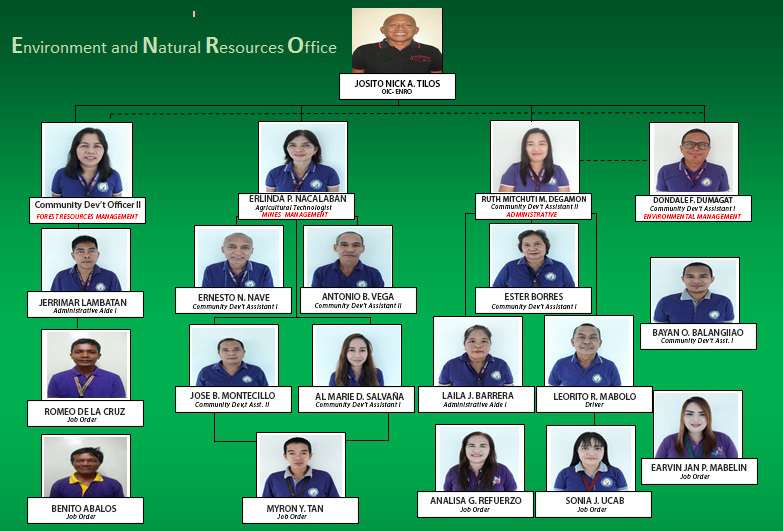 Environment and Natural Resources Office was once a division in the Office of the Provincial Agriculture of Misamis Oriental. There were several efforts and attempts in pursuit to create the division into a Department driven by the desire to provide exemplary public service in the protection and utilization of natural resources. The Environment and Natural Resources Office (ENRO) is entrusted in formulating measures for the consideration of the Sangguniang Panlalawigan (SP) in providing technical assistance and support to the Governor as the case may be in carrying out the basic delivery of basic services and facilities relative to environment and the natural resources. The office is also expected to develop plans, programs and strategies. Establish, maintain, protect and preserve communal forest, watersheds, tree parks, mangroves, greenbelts, and similar forest projects, such as industrial tree farm and agro-forestry projects as well as providing extension services to beneficiaries of forest development projects and extend technical assistance to upland farmer beneficiaries and manage and maintain seed banks and nurseries to ensure supply of planting materials. Small-scale mining and utilization of mineral resources, metallic or non-metallic, including sand and gravel extraction and other quarry resources. Coordinate with other government agencies, non-governmental organizations and academe in the implementation of Clean Air Act, Ecological Solid Waste Management and shall act as the secretariat of the Provincial Solid Waste Management Board and Watershed Management Programs. ENRO shall provide frontline services concerning the environment and natural resources, particularly in times of rehabilitation during an aftermath, man-made or natural calamities. Finally, the ENRO shall recommend to the Sangguniang Panlalawigan (SP) and advise the Governor on all matters relative to environmental protection, conservation, as well as the judicious management and utilization of natural resources. During the fresh start of its operations as a department, ENRO had seventeen (17) personnel having ten (10) detailed staff from the office of the Provincial Agriculture and Engineering while there were only seven (7) organic ENRO personnel, and 2 casual employees and one (1) Job Order worker performing and functioning horizontal tasking from four Divisions namely; Administrative Division, Mines Management Division, Forest Resources Management Division, and Environmental Management Division. ENRO has been effective in advancing and promoting environmental and ecological balance through its programs and services to Information Education Campaigns (IEC) to its partners, local communities and other stakeholders. In the aspect of promoting and projecting eco-tourism, it has able to lodged around 5,000 to 7,000 mangrove propagules in Barangay Molugan totaling a coastal land area of 12 hectares since 2006 and were able to collaborate other stakeholders from other national government agencies, non-government agencies, academes, and volunteers. Ecological Solid Waste Management Program (ESWMP) was enhanced by getting the commitment and assurance of support from the Provincial Eco-Solid Waste Management Board (PSWMB) which was revitalized and reorganized on May 4, 2006. In 2015, the Provincial Government of Misamis Oriental during the administration of Governor Yevgeney Vincente B. Emano, the office was able to submit its 1st Draft of the 10 Year Ecological Solid Waste Management Plan and also has its 3 Year Eco-Solid Waste Management Plan for the Provincial Capitol. In 2016, the Materials Recovery Facility (MRF) was constructed and functional. The Mines Management Division which is the designated secretariat of the Provincial Mining and Regulatory Board also helped in the strengthening and solidifying the said Board which tasked to ensure the regulation of extracting minerals- sand and gravel, and other quarry resources. The ENRO has able to improve the income of the province by generating revenues from the fees and charges obtained from commercial sand and gravel permit- holders and concessionaires. MANDATE – Formulate and implement plans and programs that address conservation, protection, and rehabilitation of the environment and natural resources that promote ecological balance within the framework of sustainable development. VISION – To develop the upland and coastal areas through shared responsibilities and open up window of livelihood opportunities to the people of Misamis Oriental focusing on responsible utilization of natural resources and adaptation by all stakeholders of the environmental policies and programs toward sustainable development. GOAL – To attain status wherein people of Misamis Oriental achieve a balance ecosystem comprising a sustainable and resilient communities in 2030.